"...these two stout volumes contain some of the most dedicated sleuthing in the history of literary detective work." 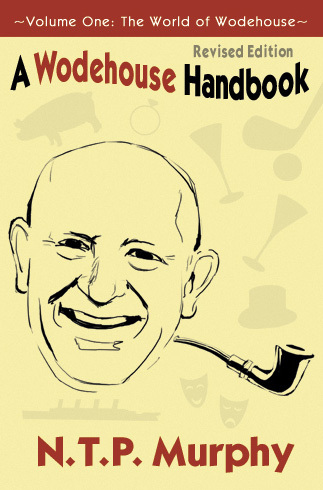 "A Wodehouse Handbook offers devotees of one of our great prose stylists more invaluable background to the characters and institutions that are the lifeblood of his novels and musicals." "We may know what Wodehouse meant when he wrote that a noise sounded like GK Chesterton falling on a sheet of tin; and we get the point about Roderick Spode and his Black Shorts. But NTP Murphy, the author of In Search of Blandings, has teased out every last meaning from such passages." In 1981, Norman Murphy caused a minor stir in literary circles when he published In Search of Blandings, which demonstrated that many of P.G. Wodehouse's legendary characters and settings were based on fact. In the two volumes of A Wodehouse Handbook, he reveals his findings across a wider field - the world that Wodehouse lived in and the sources of the many quotations and references Wodehouse used so brilliantly. In Volume 1, he tells us of Winston Churchill's first public speech; of Sam Goldwyn's typhoon that outdid Nature; how Clement Atlee made his first social protest; how the Gibson Girls kept England in suspense; of the longest golf hole ever played; and of the lady who flew the Atlantic without a map. We learn that immersion in the swimming pool (with all your clothes on) was not uncommon in a certain London club and that the home of Jeeves's Junior Ganymede is still to be found in Mayfair. The recipe for Green Swizzles is revealed at last - and a distant Wodehouse relation has provided an astonishing origin for the fabled "Buck-U-Uppo". Based on more than twenty years of searching though biographies, memoirs, obituaries and newspaper reports, Norman Murphy's discoveries encompass English and American social history from the Victorian era to the space race. He demonstrates conclusively that the world P.G. Wodehouse described was real enough. What Wodehouse did was to show the funny side of it. Norman Murphy is the official Remembrancer, and former chairman, of the PG Wodehouse Society (UK). Text & Graphics © 2013 Sybertooth Inc.